RecipeSavants.com This rustic seafood & pasta dish is easy to make and is brimming with flavor. The al dente pasta is mixed with toasted bread crumbs and aromatic herbs, then topped with tender clams. Your family will feel like they are visiting your favorite seafood restaurant! Smart Recipes, European Recipes, Other,Seafood Recipes, Recipes Other,Seafood European Clams & Linguine PT55M Serves 6 Ingredients: 0.75 Cup Extra-Virgin Olive Oil 10 Large Garlic Cloves 2 Pounds Littleneck Clams 1 Cup White Wine 4 Quarts Water 0.25 Teaspoon Crushed Red Pepper Flakes 1 Pound Fresh Linguine 2 Tablespoons Butter 1 Small Bunch Fresh Parsley 2 Tablespoons Dried Oregano 1.5 Cups Grated Parmigiano-Reggiano 1.5 Tablespoons Kosher Salt In a large Dutch oven over medium-high heat, heat 1/4 cup of oil and saute 5 garlic cloves until golden brown & aromatic, about 5 minutes. Remove the garlic, and stir in 3/4 of the clams, wine, and water. Cover and cook until clams open, about 10 minutes. Set the clams aside. Continue to heat the cooking liquid for about 10 minutes, set aside. Meanwhile, pick the clam meat from the shells, and transfer the cooking liquid to a medium bowl and set aside. In the same saucepan over medium heat, heat 1/4 cup oil and saute remaining garlic and pepper flakes until the garlic is golden brown & fragrant for about 5 minutes. Discard. Add remaining clams and reserved cooking liquid, steam clams until they open about 5 mintues. Set aside. In a Dutch oven over medium-high heat, add butter, reserved clam meat. Bring liquid to a boil and stir in the pasta, parsley & oregano. Stir in the steamed clams, tossing to coat pasta with the sauce. Garnish with the grated cheese and a drizzle of oil. If you enjoyed this easy seafood recipe, you'll love these fresh ideas! 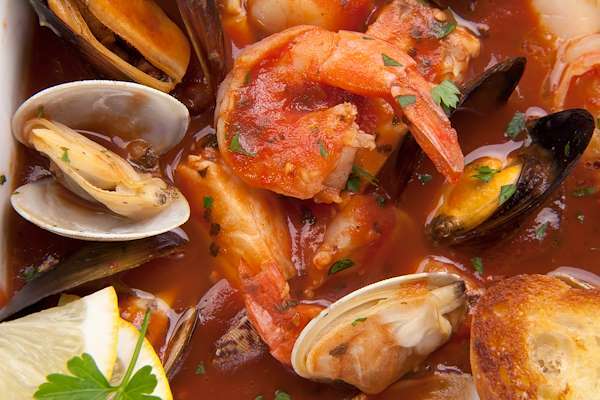 Experience the thrill and flavors of San Francisco’s famed cuisine with this yummy seafood recipe. 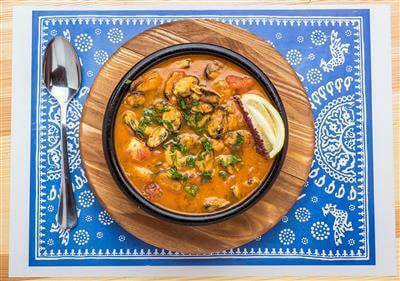 It is loaded with your favorite fish & seafood prepared in a savory tomato-based broth. Serve it with plenty of crusty bread to sop up the mouthwatering juices! This easy seafood bisque recipe is full of the savory flavors of the sea – including lobster & scallops. It is also incredibly rich with the addition of heavy cream. The additions of dry white wine, cognac and a generous amount of fresh herbs and spices only elevate this dish further. This is a restaurant-style soup that you can easily make at home.